If your firm provides estate planning data to your clients on CDs, our Estate Planning CD Holder is an ideal product for you. The covers are long-lasting leather print that present a professional image for your firm. 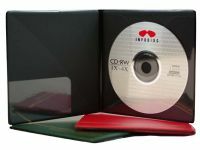 Interior features offer secure storage for the CD, your business card and other information. Custom imprinting is available to add your firm's name to the cover. Whether the CD contains a presentation explaining your firm's estate planning expertise or confidential client information, our CD Holder will keep the CD secure and protected. The holder can be used with our estate planning binders or as a stand-alone holder.